You know when you meet people and you just instantly get along with them? I’ve been crazy fortunate to experience this with a few different food bloggers and people over the past couple of months. Two of whom have been life changing. 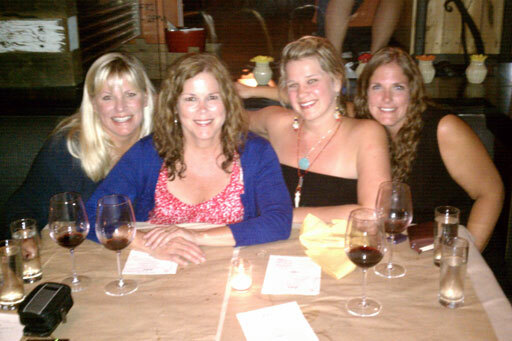 Back in September I got an invite to dinner with two of the Three Many Cooks women, Pam and Maggy Anderson and my good friend and fellow San Diegan, Lori of RecipeGirl. At dinner we shared drinks and tasty grub; laughed about life and chatted about the industry of not only food blogging but also cookbook writing and recipe development. I walked out of that dinner knowing that not only did I have a couple of new dear friends but I also had a mentor and inspirational role models in both Pam and Maggy. I made just a couple of changes to the chicken recipes in order to use up items I had on hand – Pam calls for italian or french bread but I had some seedy sourdough on hand so I subbed that as well as subbing dried tart cherries for the golden raisins and fennel for the celery (my roommate can’t stand celery and I didn’t want to eat alone!). The chicken and stuffing came out perfectly so did the baked Camembert, and seriously – it was far and away the most effortless meal I made all week! The book does exactly what it’s supposed to: feeds a group great food and frees up your time to spend with those you love. Wow, dude – apparently I’m in some kind of weird Kumbaya place in my posts lately where all I feel like doing is gushing about the awesomeness of those around me. I guess there are worse places to be. Just don’t think it’s only going to be rainbows and unicorns on this site all the damn time. 😉 I’ll return to my normal off-colored quirky self eventually but for now, go pick up a copy of Perfect One Dish Dinners and join me in gushing over the awesomeness of that is Pam Anderson! Love you, Pam! Note: Don’t even think this is a sponsored post for one minute! If you know this site – you know I don’t do sponsored posts. Period. All opinions are mine and mine alone. This post is part of a group on Sunday Suppers. (yeah – I know, I didn’t really talk about Sunday Suppers – shut up.) Check what everyone else in the group made from the book! Bring cranberries, sugar, and orange juice to a full simmer in a medium skillet or a 5- to 6-quart Dutch oven. Simmer for 1 minute. Cover, turn off heat, and let stand for 10 minutes. Stir in orange zest, cool to room temperature, and refridgerate. Adjust oven rack to lower-middle position and heat oven to 425 degrees. Roll puff pastry on a lightly floured surface along the fold lines to 12 inches long. Cut out two 6-inch rounds. Lay one pastry round on a baking sheet and set cheese wheel on it, cut side up. Top with remaining puff pastry and crimp around perimeter of cheese to seal. Bake until pastry is golden brown, about 20 minutes. Let rest for 15 minutes and serve, letting each person slice a wedge of the pastry encased cheese and top with cranberry sauce. Love fest. Recipe looks yummy! I need to make this one and soon! Love it! Ugggggggh. I LOOOOOVE this baked camembert. I could honestly eat the whole damn thing. Thanks for your lovely post. We absolutely love and adore you right back, Amanda. So glad you came into our lives and can’t wait until December!!! Oh Amanda, how I love this post and YOU. For me, you are one of those bloggers that it has been most amazing to connect with. I love everything about you, girl! And I also love that you and I have the shared experience of the Anderson women coming into your life and kinda sorta changing it in the most awesome of ways. When we moved to the East Coast, it was a dark lonely place. Then Maggy, and eventually Sharon, Pam, Andy, Dave, and Tony came into our lives. My life has become infinitely better, less lonely, and more filled with love and as you say, kumbaya, since they came into my life. That looks positively amazing! That is soooo going on my must make list! Thanks!! Great meeting you at BlogHer Food! A fancy looking appetizer that appears easy to make! I hope so. Mmmmmm! I could just have that whole entire thing for dinner myself! And perhaps I shall! I think the boys in my house would go crazy happy if I made that for them! How gorgeous is that??? I bet it tastes amazing, too! I bet you could serve that baked Camembert for dessert–it looks just that delicious. Love the photo of the four of you, too. I could use some of that and a glass of wine right about now. Any left over? Kumbaya rocks, so have it girl Stunning camembert! I have a feeling that I’ll be hiding this from my guys when I make it. This would be a great appetizer for Thanksgiving. I think I’m going to have to try it out for the family! thanks, ladies!!! i agree! i seriously LOVE LOVE LOVE our awesome food blogging community. such an amazing thing to be a part of! Mmmmm….camembert, it just can’t go wrong with that! 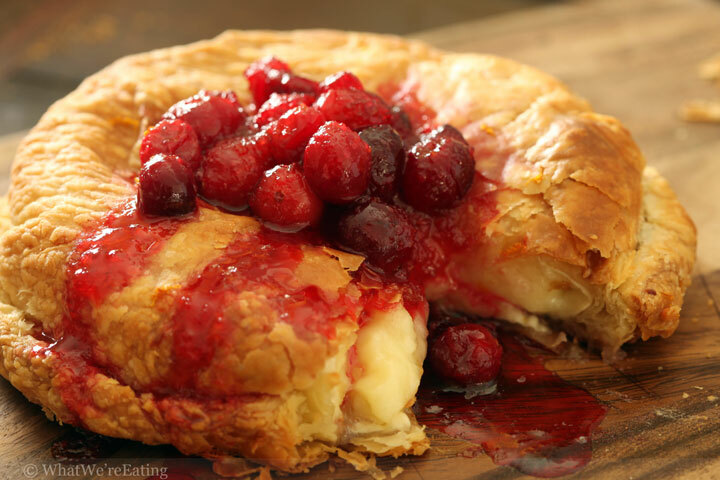 Ooh… baked camembert and cranberries?? Never even considered it, but it looks awesome. I’d eat that whole thing. I don’t like to share. Mmmmmmm I love the recipes here at your site. I am wondering if you would be interested in being a guest on my blogtalk radio show REAL Food Inspired – http://bit.ly/9zUK04. I would love it if you could do a holiday show, yum, yum. I am looking at your Persimmon cranberry sauce. I think I am going to make that this season. I have had this before and it was really wonderful but this relish must put it over the top!